Today in "They Pay Us To Do This": a performance by South Africa's Soweto Gospel Choir, which managed to tie the all-time record for most musicians squashed behind Bob Boilen's desk for a single performance in the NPR Music offices. (They join the early-music a cappella ensemble Stile Antico, also with 12, though Soweto Gospel Choir threw in percussion in the form of a lone djembe.) To watch and sway along was to be blasted with some sort of ray gun that shoots beams of joy and hope. 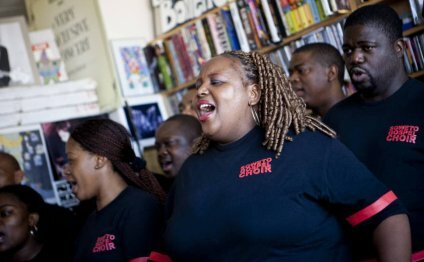 Singing in a number of South African languages, as well as English, Soweto Gospel Choir fuses the praise music of many Christian cultures, with nods to traditional African songs of celebration — complete with occasional clicks and bird songs. Taken as a whole, the group's music positively radiates warmth of spirit, not to mention motion: For as beautifully as these 12 voices blend, the rhythms are what really keep the mixture vibrant and alive. Here's hoping you get a full sense of what it was like to become enveloped in these songs live, because being there was special.